The Health Atlas will be updated yearly. View the Health Atlas' update schedule to view information about forthcoming updates. View instructions on using the Health Atlas and viewing features with multiple layers. Data on the number of Hillsborough County students eligible for free and reduced lunch is provided through Kids Count. Data on the proportion of "disconnected youth", youth between the ages of 16 and 19 who are not enrolled in school or have a job, is provided through FRED Economic Research. Data on infant mortality is provided through FLHealthCHARTS. Data on teen birth rates are available through FLHealthCHARTS. Data on children with blood lead levels greater than 10 µg/dL is available through the CDC. View the leading causes of death for Hillsborough County and the State of Florida in 2015. 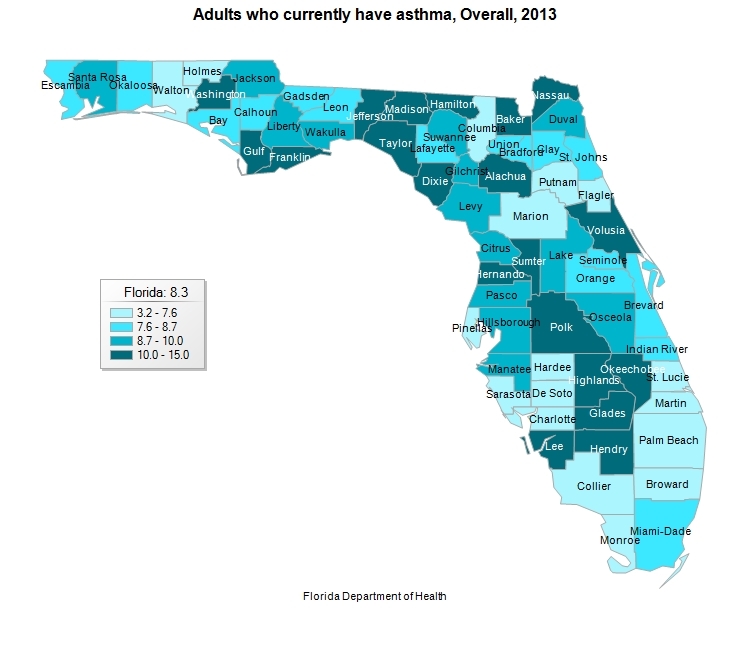 View a chart and statewide map of adults with asthma in 2013. 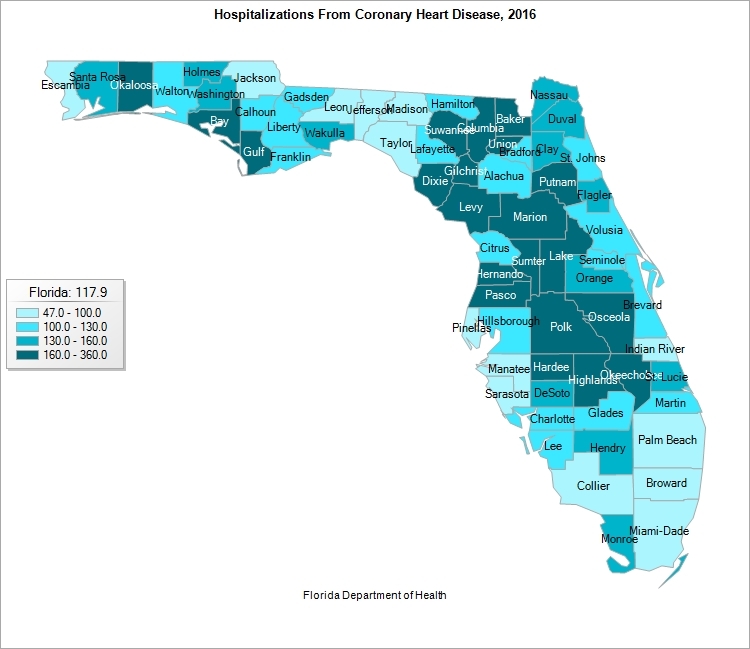 View a chart and statewide map of coronary heart disease hospitalizations in 2016. 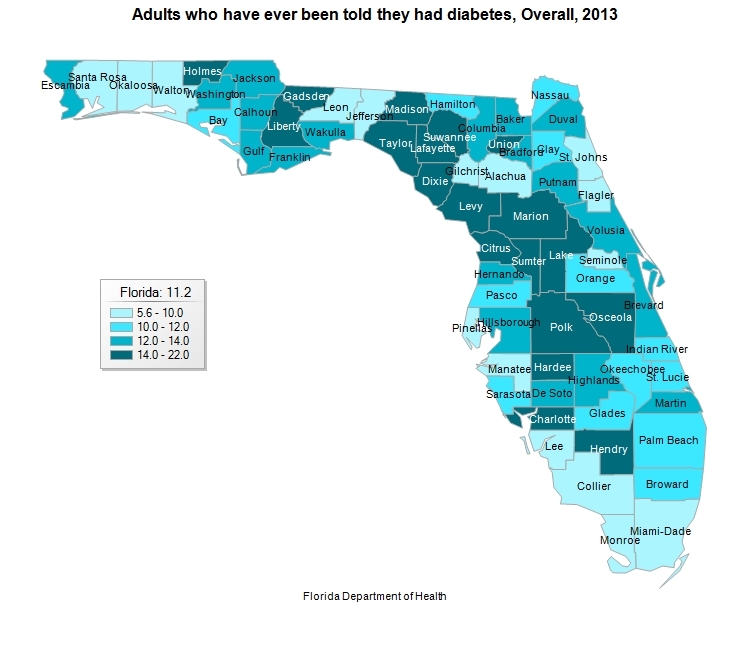 View a chart and statewide map of adults who have ever been told they had diabetes in 2013. View a statewide map of heart-related hospitalization per 100,000 residents in 2013. 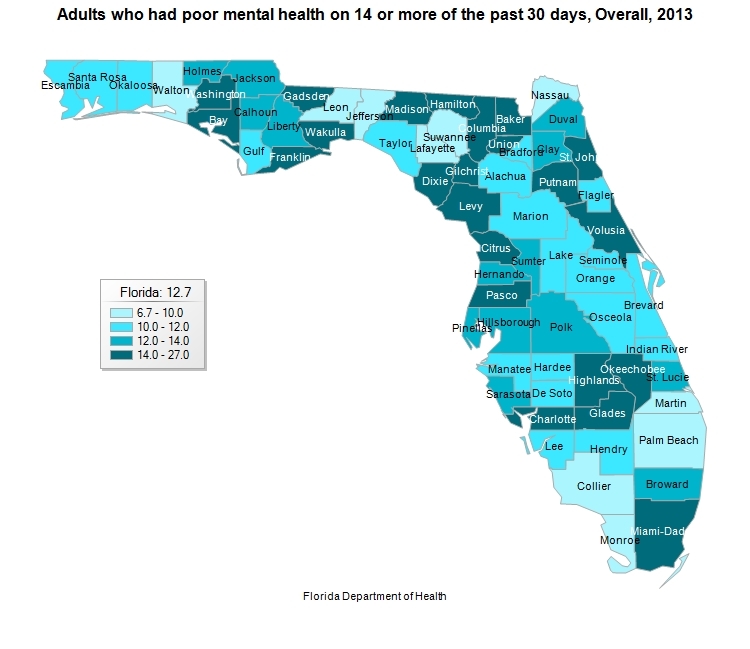 View a chart and statewide map of adults reporting poor mental health on 14 or more of the last 30 days in 2013. View a chart and statewide map of adults reporting poor physical health on 14 or more of the last 30 days in 2013.
equal access to the decision-making process to have a healthy environment in which to live, learn, and work." Read more about Environmental Justice at the EPA's webpage. The EPA provides numerous resources regarding EJ, including their EJ 2020 Action Agenda and a repository for grants, funding, technical assistance, and resources. Below are links and citations for select layers contained in the Health Atlas. 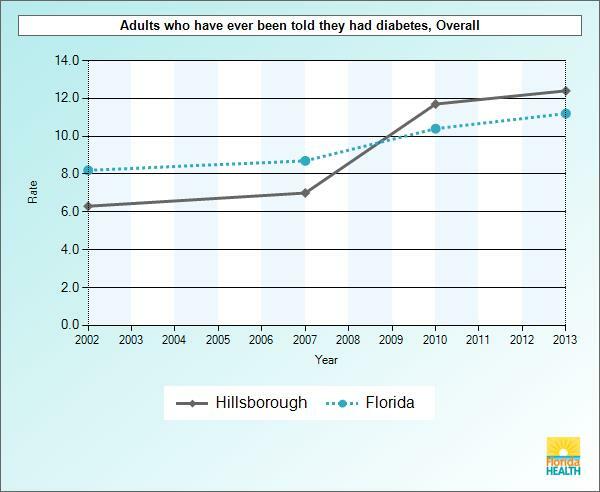 The sources for all indicators contained in the Hillsborough County Health Atlas can be found here. Effects from air pollution are often unequally distributed across communities, with low socioeconomic status communities commonly sharing a higher burden (Hajat, Hsia & O’Neill, 2015). While industrial air toxin exposure has decreased across the board over the last few decades, research has found that African American communities continue to face higher exposure than other communities (Ard, 2015). Air pollution contributes to a host of health effects, from upper respiratory irritation to lung cancer and heart disease (Kampa & Castanas, 2007). High concentrations of air pollution are also barriers to the walkability of communities, putting residents at risk even when the built environment is conducive to non-motorized forms of transit. The air toxics cancer risk data in the Hillsborough County Health Atlas is drawn from the EPA’s Environmental Justice Screening and Mapping Tool, using data from the agency’s 2011 National Air Toxics Assessment. This data is presented on the map as percentiles, comparing Hillsborough County’s census tracts to other census tracts throughout the nation. This data is calculated as “risk per lifetime per million people”, with Hillsborough’s risk varying from 32 per million on the low end to 66 per million on the high end. Ard, K. (2015). Trends in exposure to industrial air toxins for different racial and socioeconomic groups: A spatial and temporal examinations of environmental inequality in the U.S. from 1995 to 2004. Soc Sci Res, 53, 375-90. Hajat, A., Hsia, C., & O'Neill, M.S. (2015). Socioeconomic disparities and air pollution exposure: A global review. Curr Environ Health Rep, 2(4), 440-50. Kampa, M., & Castanas, E. (2008). Human health effects of air pollution. Environmental Pollution, 151(2), 362-367. Evidence suggests that asthma symptoms are exacerbated by physical inactivity and air pollution (Eijkemans, Mommers, Draaisma, Thijs & Prins, 2012; Guarnieri & Balmes, 2014), the latter of which has historically made an above-average impact on low-income communities (Marshall, Brauer & Frank, 2009). Exposure to pollutants produced on roadways is a contributor to asthma among children (Gauderman et al., 2005), and children in general are more likely to develop childhood asthma in neighborhoods with low walkability (Simons, Dell, Moineddin & To, 2014). Ensuring that improvements in air quality are distributed equitably among all members of a community, and enabling safe and walkable neighborhoods, are key to controlling asthma regardless of age. 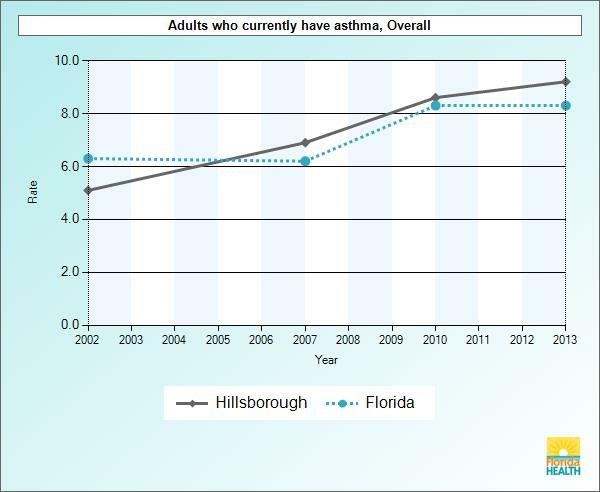 Census Tract-level asthma data in the Hillsborough County Health Atlas is provided through the CDC 500 Cities project for Tampa only. The indicator is an estimate of adults age 18 years or older with current asthma in the year 2014. County-scale data is available through Florida Health for the year 2013. When small area estimates become available for Plant City, Temple Terrace and the unincorporated communities of Hillsborough County, this indicator will be supplemented with that data. Eijkemans, M., Mommers, M., Draaisma, J.M.T., Thijs, C., & Prins, M.H. (2012). Physical activity and asthma: A systematic review and meta-analysis. PLoS One, 7(12), e50775. Guarnieri, M., & Balmes, J.R. (2014). Outdoor air pollution and asthma. The Lancet, 383(9928), 1581-92. Gauderman, W.J., Avol, E., Lurmann, F., Kuenzli, N., Gilliland, F., Peters, J. & McConnell, R. (2005). Childhood asthma and exposure to traffic and nitrogen dioxide. Epidemiology, 16(6), 737-43. Marshall, J.D., Brauer, M., & Frank, L.D. (2009). Healthy neighborhoods: Walkability and air pollution. Environ Health Perspect, 117(11), 1752-9. Simons, E., Dell, S., Moineddin, R., & To, T. (2014). Longitudinal associations between neighbourhood walkability and incident childhood asthma. Allergy Asthma Clin Immunol, 10(Suppl 1), A8. According to the Florida Department of Environmental Protection, brownfields are "abandoned, idled, or underused industrial and commercial facilities where expansion or redevelopment is complicated by real or perceived environmental contamination" (Florida Geographic Data Library, 2016). Read more about brownfields on the EPA's website. Communities of Concern are block groups with a greater than one standard deviation above the countywide average proportion of two or more of the following demographic groups: minority, low-income, elderly (65 years or older), Limited English Proficiency, disability, car-less, or youth (Williams & Golub, 2017, pp. 39). These statistics are calculated by the University of South Florida’s Center for Urban Transportation Research using U.S. Census Bureau data. Walkable neighborhoods may be a factor in lowering risk from coronary heart disease, in addition to promoting healthy weight for communities living within them (Lovaski, Grady & Rundle, 2011). Individuals across all age categories and among both healthy and patient populations are shown to experience cardiovascular benefits from walking (Murtagh, Murphy & Boone-Heinonen, 2010). Walking or biking to work is associated with lower rates of obesity and blood pressure among both men and women, in addition to other benefits (Gordon-Larsen, Boone-Heinonen, Sidney, Sternfeld, Jacobs Jr & Lewis, 2009). Census Tract-level coronary heart disease data in the Hillsborough County Health Atlas is presented as the proportion of adults over 18 reporting having coronary heart disease in the year 2014. This data is provided through the CDC 500 Cities project for Tampa only. Age-adjusted county-scale data is available through Florida Health for the year 2016. When small area estimates become available for Plant City, Temple Terrace and the unincorporated communities of Hillsborough County, this indicator will be supplemented with that data. Gordon-Larsen, P., Boone-Heinonen, J., Sidney, S., Sternfeld, B., Jacobs Jr, D.R., & Lewis, C.E. (2009). Active commuting and cardiovascular disease risk the CARDIA study. JAMA Internal Medicine, 169(13), 1216-1223. Lovasi, G.S., Grady, S., & Rundle, A. (2012). Steps forward: Review and recommendations for research on walkability, physical activity and cardiovascular health. Public Health Rev., 33(4), 484-506. Murtagh, E.M., Murphy, M.H. & Boone-Heinonen, J. (2010). Walking - the first steps in cardiovascular disease prevention. Curr Opin Cardiol, 25(5), 490-496. Rasmussen, M.G., Grontved, A., Blond, K., Oerad, K., Tjonneland, A., Jensen, M.K. & Ostergaard, L. (2016). Associations between recreational and commuter cycling, changes in cycling, and type 2 diabetes risk: A cohort study of Danish men and women. PLOS Med 13(7), e1002076. As with crashes, crime and violence have a self-evident and direct impact on health. Yet the accessibility of neighbors and degree of physical activity one participates in may also be indirectly influenced by crime as well. For individuals with anxiety about crime, unsafe feelings may affect their level of physical activity (Foster & Giles-Corti, 2008). Social cohesion is also negatively associated with crime (Armstrong, Katz & Schnebly, 2015). The accessibility of neighbors may therefore allow residents to develop stronger bonds with their immediate community, influencing the type of cohesion that keeps neighborhoods safe. Foster, S., & Giles-Corti, B. (2008). The built environment, neighborhood crime and constrained physical activity: An exploration of inconsistent findings. Prev Med, 47(3), 241-51. Armstrong, T.A., Katz, C.M., Schnebly, S.M. (2015). The relationship between citizen perceptions of collective efficacy and neighborhood violent crime. Crime & Delinquency, 61(1), 121-142. Census Tract-level diabetes data in the Hillsborough County Health Atlas is provided through the CDC 500 Cities project for Tampa only. The indicator is an estimate of adults age 18 years or older with diagnosed diabetes in the year 2014. County-scale data is available through Florida Health for the year 2013. When small area estimates become available for Plant City, Temple Terrace and the unincorporated communities of Hillsborough County, this indicator will be supplemented. Hosler, A.S., Gallant, M.P., Riley-Jacome, M., & Rajulu, D.T. (2014). Relationship between objectively measured walkability and exercise walking among adults with diabetes. J Environ Public Health. Mayo Clinic Staff. (2014). Diseases and conditions: Diabetes. Retrieved from http://www.mayoclinic.org/diseases-conditions/diabetes/basics/complications/con-20033091. Smalls, B.L., Gregory, C.M., Zoller, J.S., Egede, L.E. (2015). Assessing the relationship between neighborhood factors and diabetes related health outcomes and self-care behaviors. BMC Health Serv Res, 15, 445.
the tract is in a metropolitan area and has a median family income less than or equal to 80% of the metropolitan area’s median family income. Definition is acquired from the USDA. More documentation for food deserts can be found on the USDA's website. Hazardous Waste Facility Proximity is determined by the EPA for their EJScreen tool, using 2015 EPA RCRAInfo data. This indicator counts the number of treatment storage and disposal sites within 5 km (or closest beyond 5 km), dividing that number by the distance in km. Learn more about HPSAs at the DHHS website. According to the National Weather Service, heat was the leading weather-related cause of death in 2016, beating floods, tornados and hurricanes (2017). Heat vulnerability is especially threatening to the elderly, children and the homeless, all of whom face increased or persistent risks from exposure. Factors like tree coverage in a neighborhood not only provide a natural cooling effect for the neighborhood, but allows pedestrians and other vulnerable users to access shade on the way to their destinations. Neighborhood vegetation may also contribute to lowering the heat island effect common in urban neighborhoods, where heat-related deaths tend to be the highest. 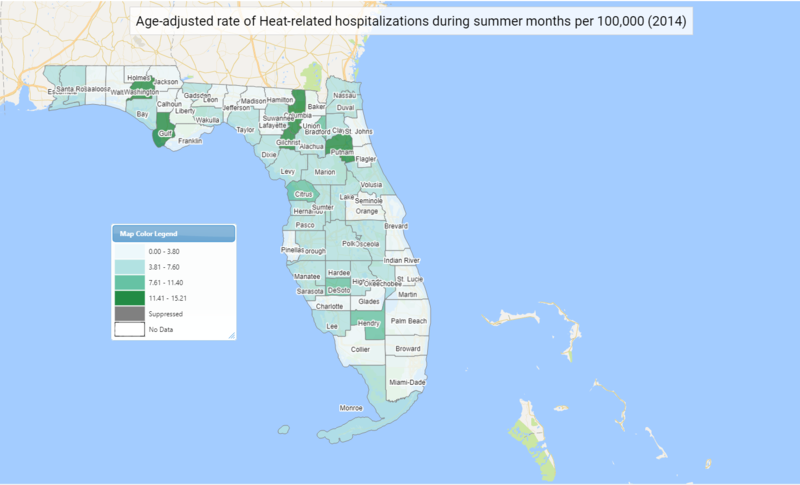 The Hillsborough County Health Atlas presents the number of heat-related hospitalizations during the summer months, rate per 100,000, at the county level. This data is obtained by the Agency for Health Care Administration via medical coding records. When city-level or small area estimates become available, this indicator will be supplemented with that data. Harlan, S.L., Declet-Barreto, J.H., Stefanov, W.L., & Petitti, D.B. (2013). Neighborhood effects on heat deaths: Social and environmental predictors of vulnerability in Maricopa County, Arizona. Environmental Health Perspectives, 121(2), 197-204. National Weather Service. (2017). Weather fatalities 2016. Retrieved from http://www.nws.noaa.gov/om/hazstats.shtml. Reid, C.E., et al. (2012). Evaluation of a Heat Vulnerability Index on abnormally hot days: An environmental public health tracking study. Environmental Health Perspectives, 120(5), 715-20. Reid, C.E., et al. (2009). Mapping community determinants of heat vulnerability. Environmental Health Perspectives, 117(11), 1730-36. Wilhelmi, O.V., & Hayden, M.H. (2010). Connecting people and place: A new framework for reducing urban vulnerability to extreme heat. Environmental Research Letters, 5(1). Blood lead levels vary with exposure to lead paint, specifically in infants (Rabinowitz, Leviton, & Bellinger, 1985). While lead paint was banned in 1978 nationally, EPA tracks the presence of homes constructed prior to 1960 to determine the likelihood of neighborhood exposure to the metal. High blood lead levels are a cause for renal diseases and anemia, among others (Goyer, 1990). High blood lead levels are particularly harmful for children, for whom it may affect brain and central nervous system development (WHO). This indicator in the Hillsborough County Health Atlas tracks the percentage of homes in a block group built before 1960, which "may indicate exposure to lead paint". The indicator is estimated by the EPA for their EJScreen tool using 2010-2014 American Community Survey data. Goyer, R.A. (1990). Lead toxicity: From overt to subclinical to subtle health effects. Environ Health Perspect, 8, 177-181. Rabinowitz, M., Leviton, A., & Bellinger, D. (1985). Home refinishing, lead paint, and infant blood lead levels. AJPH, 75(4), 403-4. World Health Organization. (2016). Lead poisoning and health. Retrieved from http://www.who.int/mediacentre/factsheets/fs379/en/. Lack of physical activity is a major risk factor for a variety of negative health effects that persist from childhood to adulthood. Higher levels of physical activity promote better cardiovascular health outcomes, and decrease the risk of obesity (Myers et al., 2015). When combined with a healthy diet, physical activity can lower the risk of complications from type 2 diabetes (Balk et al., 2015). An individual’s level of physical activity has a direct effect on or result from many of the other variables in this Health Atlas, and promoting travel for non-motorized users can help create an environment where individuals have more opportunities to exercise and make healthy choices. Lack of any leisure time physical activity data in the Hillsborough County Health Atlas is provided through the CDC 500 Cities project for Tampa only. The indicator is an estimate of adults age 18 years or older who engage in no leisure time physical activity in the year 2014. When small area estimates become available for Plant City, Temple Terrace and the unincorporated communities of Hillsborough County, this indicator will be supplemented with that data. Balk, E.M., Earley, A., Gowri, R., Avendano, E.A., Pittas, A., & Remington, P.L. (2015). Combined diet and physical activity promotion programs to prevent type 2 diabetes among persons at increased risk: A systematic review for the Community Preventive Services Task Force. Ann Intern Med., 163(6), 437-51. Myers, J., McAuley, P., Lavie, C.J., Despres, J.P., Arena, R., & Kokkinos, P. (2014). Physical activity and cardiorespiratory fitness as major markers of cardiovascular risk: Their independent and interwoven importance to health status. Progress in Cardiovascular Diseases. The National Pollutant Discharge Elimination System is a permitting process performed by the EPA to limit what can be discharged into United States waters, and includes requirements for monitoring and reporting. This purpose of this program is to ensure discharge does not hurt water quality or people's health (EPA, 2017). This data set contains locations of EPA-regulated NPDES facilities. Obesity is a contributor to type 2 diabetes, high blood pressure, cholesterol, and a variety of other ailments and diseases (Mayo Clinic, 2015). There is evidence that neighborhood disparities affect the prevalence of obesity, and that segregation may be a direct contributor (Corral et al., 2011). Individuals living in low-income neighborhoods commonly face poor access to supermarkets and healthy foods, while fast food tends to be more prevalent within these communities (Larson, Story & Nelson, 2009). Children living in neighborhoods with low walkability face considerably higher chances of being overweight or obese compared to their counterparts in highly walkable neighborhoods (Singh, Siahpush & Kogan, 2010). Access and opportunities for outdoor exercise are directly related to a community's built environment. Census Tract-level obesity data in the Hillsborough County Health Atlas is provided through the CDC 500 Cities project for Tampa only. The indicator is an estimate of adults age 18 years or older with obesity in the year 2014. 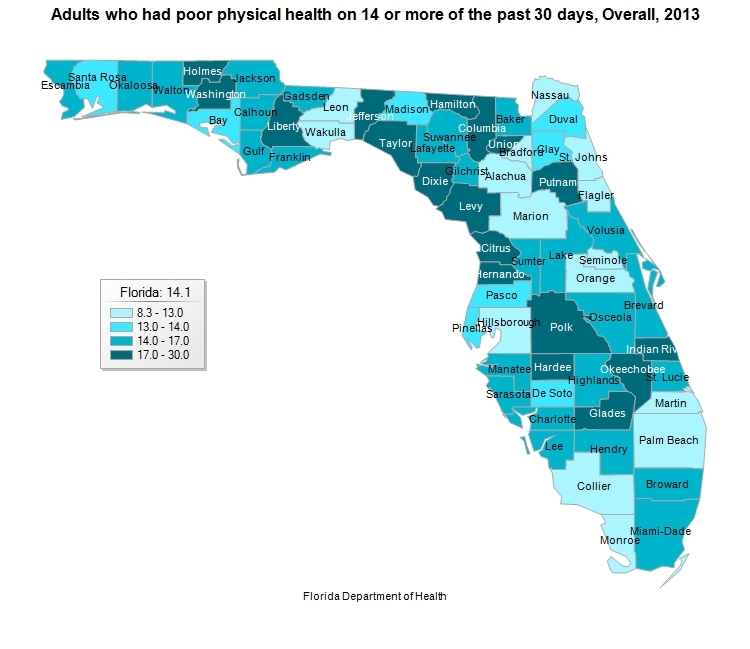 County-scale data is available through Florida Health for the year 2013. When small area estimates become available for Plant City, Temple Terrace and the unincorporated communities of Hillsborough County, this indicator will be supplemented with that data. Corral, I., et al. (2011). Residential segregation, health behavior and overweight/obesity among a national sample of African American adults. Journal of Health Psychology, 17(3), 371-8. Larson, N.I., Story, M.T., & Nelson, M.C. (2009). Neighborhood environments: Disparities in access to healthy foods in the U.S. Am J Prev Med, 36(1), 74-81. Mayo Clinic Staff. (2015). Diseases and conditions: Obesity. Retrieved from http://www.mayoclinic.org/diseases-conditions/obesity/basics/complications/con-20014834. Singh, G.K., Siahpush, M., & Kogan, M.D. (2010). Neighborhood socioeconomic conditions, built environments, and childhood obesity. Health Aff, 29(3), 503-12. Part of the EPA's Environmental Justice Screening Tool, the Hillsborough County Health Atlas' ozone indicator refers to the "summer seasonal average of daily maximum 8-hour concentration in air in parts per billion" as of 2012 (EPA). Overall, increases in ambient ozone also increases the risk of daily, cardiovascular and respiratory mortality (Bell, McDermott, Zeger, Samet, & Dominici, 2004). Among children, time spent outside in areas with high ozone increase the risk of developing asthma (McConnell et al., 2002). For children under the age of 2, summertime ambient ozone levels increase the daily respiratory-related hospitalization rate (Burnett et al., 2001). Compared to the rest of the nation, Hillsborough County's ozone concentration rates are low. The highest concentration of ozone in any Hillsborough block group is 37.3 ppb, which corresponds to a nationwide percentile of 12%. Bell, M.L., McDermott, A., Zeger, S.L., Samet, J.M., & Dominici, F. (2004). Ozone and short-term mortality in 95 US urban communities, 1987-2000. JAMA, 292(19), 2311-430. Burnett, R.T., Smith-Doiron, M., Stieb, D., Raizenne, M.E., Brook, J.R., Dales, R.E., Leech, J.A., Cakmak, S., & Krewski, D. (2001). Association between ozone and hospitalization for acute respiratory diseases in children less than 2 years of age. Am J Epidemio, 153(5), 444-52. EPA. Glossary of EJSCREEN terms. Retrieved from https://www.epa.gov/ejscreen/glossary-ejscreen-terms. McConnell, R., Berhane, K., Gilliland, F., London, S.J., Islam, T., Gauderman, W.J., Avol, E., Margolis, H.G., & Peters, J.M. (2002). Asthma in exercising children exposed to ozone: A cohort study. The Lancet, 359(9304), 386-91. Particulate matter (PM) 2.5 refers to the annual average of matter smaller than 2.5 micrometers in diameter in the air, as measured in micrograms per cubic meter in 2012 (EPA). High concentration of PM2.5 is associated with premature mortality, specifically from cardiopulmonary and lung cancer-related deaths (Boldo et al., 2006). Research using estimates from 2005 suggests that, nationwide, 130,000 PM2.5-related deaths occurred in that year due to air quality levels (Fann et al., 2011). This is more than 25 times the number of deaths attributed to ozone-related mortality in 2005. Among children, increases in PM2.5 concentrations result in hospital admissions for asthma (Hakan Tecer, Alagha, Karaca, Tuncel & Eldes, 2008). As with ozone, Hillsborough County has fairly low PM2.5 concentrations compared to the rest of the nation. The highest PM2.5 concentration in any Hillsborough block group is 7.7 ug/m3, corresponding to a nationwide percentile of 17%. Boldo, E., Medina, S., Le Tertre, A., Hurley, F., Mucke, H.G., Ballester, F., & Aguilera, I. (2006). Apheis: Health Impact Assessment of long-term exposure to PM2.5 in 23 European cities. European Journal of Epidemiology, 21(6), 449-58. Fann, N. Lamson, A.D., Anenberg, S.C., Wesson, K., Risley, D., & Hubbell, B.J. (2011). Estimating the national public health burden associated with exposure to ambient PM2.5 and ozone. Risk Analysis, 32(1), 81-95. Tecer, L.H., Alagha, O., Karaca, F., Tuncel, G., & Eldes, N. (2008). Particulate matter (PM2.5, PM10-2.5, and PM10) and children's hospital admissions for asthma and respiratory diseases: A bidirectional case-crossover study. Journal of Toxicology and Environmental Health, 71(8), 512-20. Premature mortality refers to a person with unfulfilled life expectancy, who perishes before their expected age. This indicator correlates with several of the others in the Health Atlas, such as obesity and diabetes (Pratley, 2013; Hirko et al., 2015). The built environment can have an impact as well: residents living in unsafe neighborhoods often have a lower life expectancy (Redelings, Lieb & Sorvillo, 2010). The presence of greenspace may provide both environmental and health benefits, increasing the life expectancy of residents. Premature mortality in the context of the Hillsborough County Health Atlas is presented as the years of potential life lost, and number of premature deaths, for individuals under the age of 75. This information is derived from National Vital Statistics System mortality files, and is available at the county level. Hirko, K.A., Kantor, E.D., Cohen, S.S., Blot, W.J., Stampfer, M.J., & Signorello, L.B. (2015). Body mass index in young adulthood, obesity trajectory, and premature mortality. Am J Epidemiol, 182(5), 441-450. Pratley, R.E. (2013). Supplement introduction. Am J Med, 126(9)(Suppl 1), S1. Redelings, M., Lieb, L., & Sorvillo, F. (2010). Years off your life? The effects of homicide on life expectancy by neighborhood and race/ethnicity in Los Angeles County. J Urban Health, 87(4), 670-6. According to the EPA, the respiratory hazard index is the “sum of hazard quotients for substances that affect the same target organ or organ system” (EPA). When targeted to a specific organ, exposures below 1.0 are unlikely to result in adverse non-cancer health effects over a lifetime. However, an index value greater than 1.0 for a given block group does not necessarily indicate that a lifetime of exposure will result in adverse health effects. Block groups with a HI greater than 1.0 must be evaluated on a variety of factors to determine whether pollutants will have adverse health effects on the individuals living within them. EPA. NATA: Glossary of terms. Retrieved from https://www.epa.gov/national-air-toxics-assessment/nata-glossary-terms. RMP Facility Proximity is calculated by the EPA for their EJScreen tool, using 2015 EPA RMP data. This indicator counts the number of Risk Management Plan sites within 5 km (or closest beyond 5 km), dividing that number by the distance in km. In addition to promoting physical health, accessible parks and green space within communities have a positive impact on mental health as well. Residents living in neighborhoods with substantial presence of green space report lower levels of stress, anxiety and depression (Beyer et al., 2014). Residents living close to parks also report mental health benefits (Sturm & Cohen, 2014). For residents of low socioeconomic status neighborhoods, higher neighborhood safety concerns may be related to lower mental health and self-reported health overall (Meyer, Castro-Schilo & Aguilar-Gaxiola, 2014). Improving the immediate and surrounding neighborhoods of disadvantaged residents has a positive impact on their mental health (Graif, Arcaya & Roux, 2016). 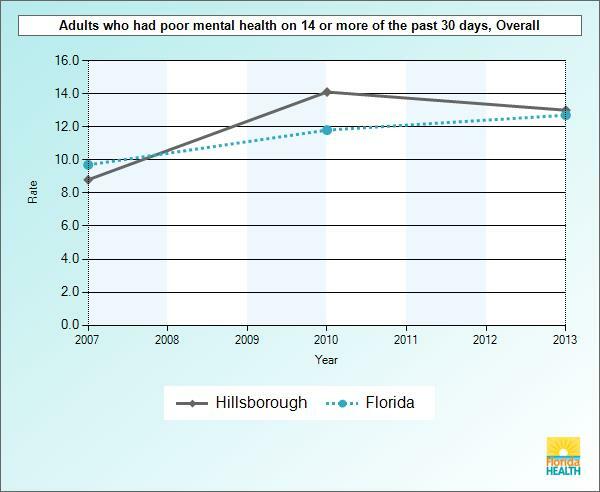 Census Tract-level self-reported mental health data in the Hillsborough County Health Atlas is presented as the proportion of adults over 18 reporting their mental health has been "not good" for 14 or more days in the year 2014. This data is provided through the CDC 500 Cities project for Tampa only. 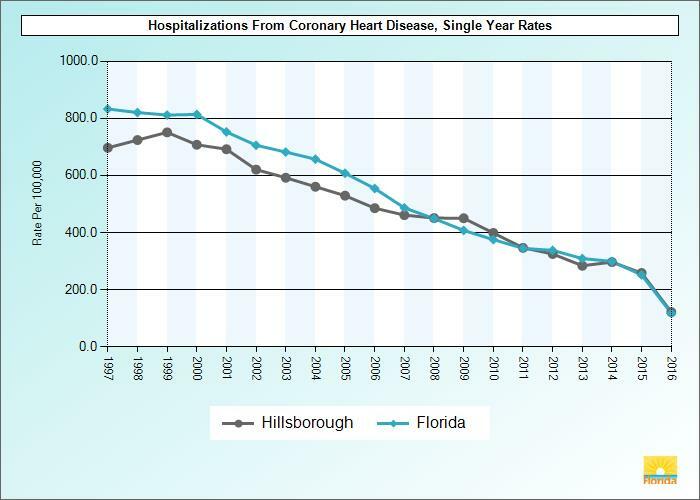 County-scale data is available through Florida Health for the year 2013. When small area estimates become available for Plant City, Temple Terrace and the unincorporated communities of Hillsborough County, this indicator will be supplemented with that data. Beyer, K.M.M., Kaltenbach, A., Szabo, A., Bogar, S., Nieto, F.J., & Malecki, K.M. (2014). Exposure to neighborhood green space and mental health: Evidence from the Survey of the Health of Wisconsin. Int J Environ Res Public Health, 11(3), 3453-72. Cohen-Cline, H., Turkheimer, E., & Duncan, G.E. (2014). Access to green space, physical activity and mental health: A twin study. Journal of Epidemiology & Community Health, 69(6). Meyer, O.L., Castro-Schilo, L., & Aguilar-Gaxiola, S. (2014). Determinants of mental health and self-rated health: A model of socioeconomic status, neighborhood safety, and physical activity. AJPH, 104(9), 1734-41. Graif, C., Arcaya, M.C., & Roux, A.V.D. (2016). Moving to opportunity and mental health: Exploring the spatial context of neighborhood effects. Soc Sci Med, 162, 50-58. Sturm, R. & Cohen, D. (2014). Proximity to urban parks and mental health. J Ment Health Policy Econ, 17(1), 19-24. Research suggests that self-reported health has become increasingly more valid with regard to predicting actual health over time (Shnittker & Bacak, 2014). Various factors influence self-rated health, including an individual's socioeconomic position over their life course and the degree of racial discrimination they are subjected to (Hudson, Puterman, Bibbins-Domingo, Matthews & Adler, 2013). Residents in more walkable neighborhoods spend more time on physical activity, and walkability of a neighborhood relates positively to self-reported health (Villenueve et al., 2017). 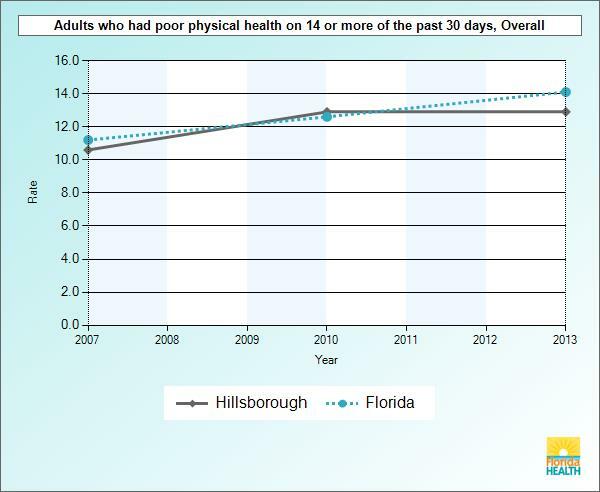 Census Tract-level self-reported physical health data in the Hillsborough County Health Atlas is presented as the proportion of adults over 18 reporting their physical health has been "not good" for 14 or more days in the year 2014. This data is provided through the CDC 500 Cities project for Tampa only. County-scale data is available through Florida Health for the year 2013. When small area estimates become available for Plant City, Temple Terrace and the unincorporated communities of Hillsborough County, this indicator will be supplemented with that data. Hudson, D.L., Puterman, E., Bibbins-Domingo, K., Matthews, K.A., & Adler, N.E. (2013). Race, life course socioeconomic position, racial discrimination, depressive symptoms and self-rated health. Soc Sci Med, 97, 7-14. Schnittker, J. & Bacak, V. (2014). The increasing predictie validity of self-rated health. PLoS ONE, 9(1), e84933. Villenueve, P., Root, A., Kumar, N., Ambrose, S., Dimuzio, J., Rainham, D., & Ysseldyk, R. (2017). Are neighborhood walkability and greenness associated with increased physical activity and better self-rated health? Findings from the Beyond Health Survey of adults in Ottawa, Canada. J Transp Health, 5(S), S88. As represented in Hillsborough County’s Vision Zero initiative as well as in the Health Atlas, severe crashes are those where at least one fatal or incapacitating injury occurs. The data present on the map shows all severe crashes in Hillsborough County from 2012 to 2016. Severe crashes have a self-evident impact on health. Residents in neighborhoods near particularly high-crash intersections or corridors may be less likely to walk or bike to their destinations, or may face greater risks in doing so. For residents who utilize walking or biking as their primary mode of travel, this may have an effect on both physical health and their ability to travel safely through their neighborhoods. Location of Water Assurance Compliance System Solid Waste Facilities within Hillsborough County. The Solid Waste Program "regulates [...] the design, construction, operation and maintenance of Solid Waste Facilities. It ensures the proper closure and long-term monitoring and maintenance of those facilities which have concluded useful production, or which are otherwise required by rule to be closed" (FDEP, 2007). Superfund Proximity is determined by the EPA for their EJScreen tool, using 2015 EPA CERCLIS data. This indicator counts the number of superfund sites within 5 km (or closest beyond 5 km), dividing that number by the distance in km. Superfund sites are sites regulated by the EPA and contained in the Superfund Enterprise Management System. These sites include "sites proposed to the NPL, currently on the final NPL or deleted from the final NPL", "sites with a Superfund Alternative Approach agreement, as well as Non-NPL sites". View the data source or read more about Superfund sites at the EPA's website. Toxic Release Inventory Facilities reflect submissions received by the EPA from facilities that meet TRI reporting requirements (EPA, 2017). If a facility is in a specific industry sector, employs 10 or more full-time equivalent employees, and manufactures, processes, or uses a TRI-listed chemical in qualities above threshold levels in a given year, the facility must report to the EPA's TRI program. Included in the EPA’s Environmental Justice Screening and Mapping Tool, traffic proximity is calculated as the “count of vehicles per day at major roads within 500 meters (or nearest one beyond 500m), divided by distance in meters” (EPA). Research suggests that approximately 4% of the population lives within 150 meters of a major highway, although those proportions are higher for certain minority populations (Boehmer, 2013). Close residential proximity to a major highway elevates exposure to air pollution from traffic. Consistent exposure to pollution from air traffic promotes atherosclerosis, and may also raise risks of low birth weight and premature births for mothers under certain conditions (Armijos et al., 2015; Wilhelm & Ritz, 2003). Traffic volume is derived from MPO traffic counts. This data provides information about the number of vehicles passing along a roadway. Armijos, R.X., Weigel, M.M., Myers, O.B., Li, W.W., Racines, M., & Berwick, M. (2015). Residential exposure to urban traffic is associated with increased carotid intima-media thickness in children. Journal of Environmental and Public Health. Boehmer, T.K., et al. (2013). Residential proximity to major highways – United States, 2010. CDC Supplements, 62(3), pp 46-50. Wilhelm, M. & Ritz, B. (2003). Residential proximity to traffic and adverse birth outcomes in Los Angeles county, California, 1994-1996. Environmental Health Perspectives, 111(2), pp 207-16. Transportation Improvement Program (TIP) projects are mapped projects derived from the 2016-2017 TIP. The TIP is a five year plan that identifies, prioritizes and allocates funding for transportation projects. Learn more about the TIP on its webpage. The EPA Walkability Index is a product of the EPA's Smart Location Mapping that ranks block groups according to their relative walkability. Data is derived from the 2010 U.S. Census. Read more at the EPA's website. Hazardous Waste Facility Proximity is calculated by the EPA for their EJScreen tool, using 2015 PCA/ICIS data. This indicator counts the number of major water discharger sites within 5 km (or closest beyond 5 km), dividing that number by the distance in km. Link to the CDC's BRFSS webpage, which provides yearly data at the state level regarding a variety of health indicators. Contains maps, charts and data for environmental, health and community indicators at the county level throughout the state of Florida. Contains data on health indicators, including county profiles and queryable information on births, deaths, marriages and reportable diseases. This map shows how many jobs in Hillsborough County are located within flood zones. Provides a summary of employment, demographics, and commuting patterns. Disclaimer: The Indicators/Data Sources tab at the top right of the map contains a list of sources for each indicator, which should be consulted for more information. Map data is obtained from various publicly-accessible sources that have the final say on accuracy.